Granite Steps supplied by J.H. Wagner & Sons. Granite steps from J.H. Wagner & Sons can be provided in either solid form or as step tread and riser pieces. 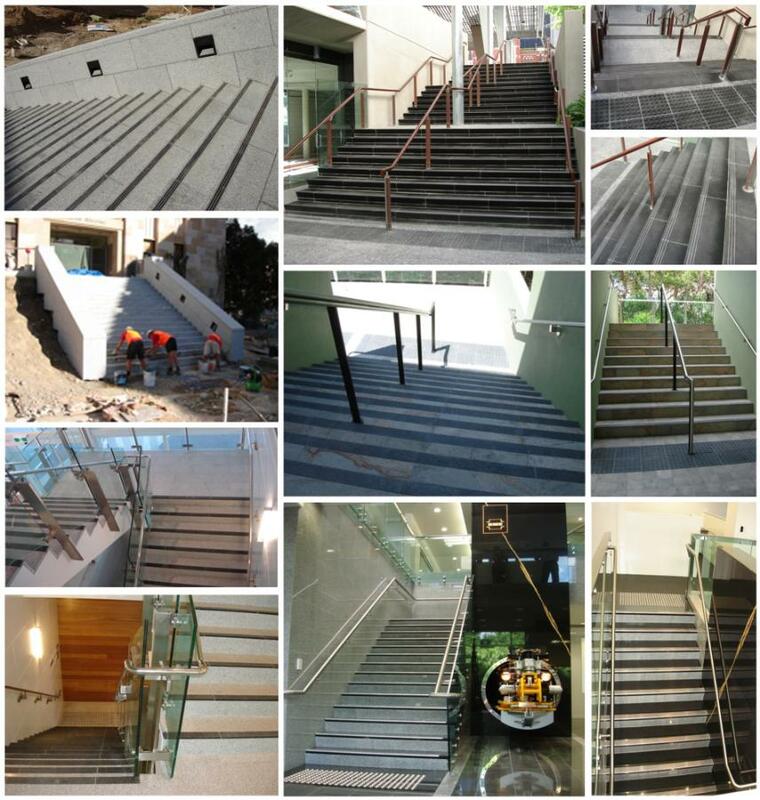 When combining options of surface finishes including polished, honed, exfoliated or flamed, bushhammered, sandblasted, bright etched and brushed with a choice of over fifty granite colours we can assure you that the granite step for your project is available at JHW. Granite steps are stylish and durable and with the correct selection of surface finish are suitable for either internal or external use. To meet building code requirements we are able to offer stair nosings in a contrast colour where needed to provide a visual colour separation and a stunning appearance. Perhaps consider combining granite steps with our granite Braille Tiles to further assist the visually impared and improve public safety. For large or small quantities, backyard landscape, a stunning new home fit-out, public area or commercial project, J.H. Wagner & Sons will have the granite step to suit. At J.H. Wagner we hold stocks of solid Yellow granite steps. These granite steps are the ultimate easy to use landscape step, saving you time and money in site preparation and installation. The size of 1000mm long x 400mm deep and 170mm high allows for correct step height and enough depth front to back so that the stone above can sit onto the back edge of the solid granite step block and still allow a tread area of approximately 350mm. The top face, two short ends and 1 long edge of the JHW Yellow granite solid steps is exfoliated (flamed), providing a stylish appearance and slip safe top surface. The remaining long edge has a rockfaced finish allowing you the choice of showing a rustic rock finish in the step front or placing this to the back and using the exfoliated (flamed) long edge to the step front. Yellow granite solid steps combine with and compliment all of our Sandstone landscaping and paving products. They also match with our Yellow granite exfoliated paving tiles.